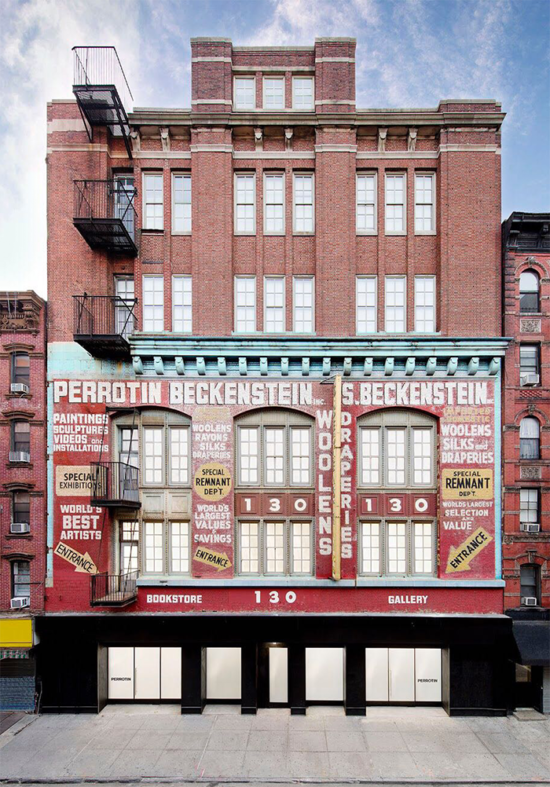 Famed mega-gallery Galerie Perrotin made the move downtown from the Upper East Side last April to the Beckenstein Building, an industrial space dating from the 1880s. 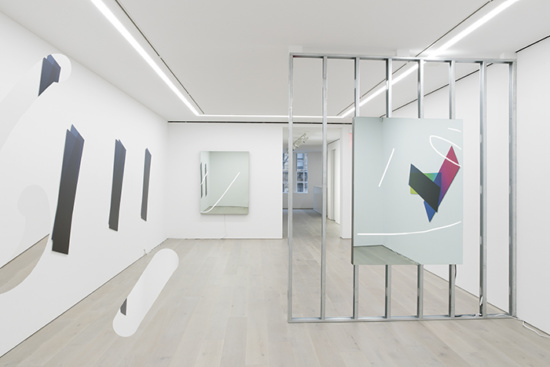 Fourteen months after construction began, the gallery has finally unveiled all three floors of their new Lower East Side home. 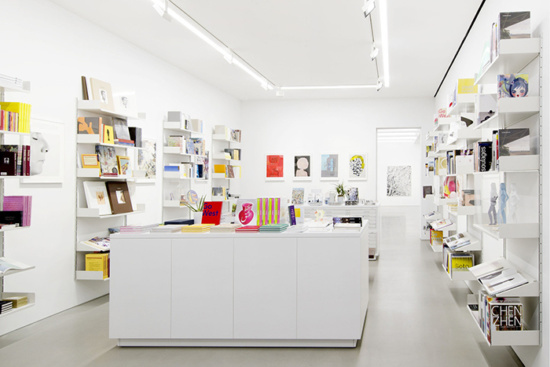 Brooklyn-based Peterson Rich Office (PRO) oversaw the 25,000-square-foot, five-story renovation of the building, which includes not only three floors of public exhibition space, but also storage, office and private exhibition space, as well as a street-level shop featuring art books and affordable small editions. 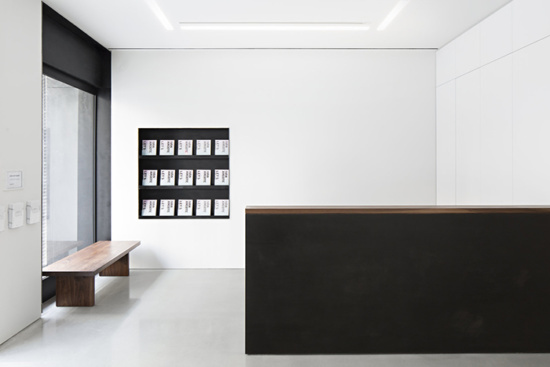 While both Miriam Peterson and Nathan Rich, the principals of PRO, have developed art spaces with previous firms and have collaborated with galleries like Luhring Augustine to create exhibition displays, this is the first commercial gallery designed by the office. And they hardly started small. 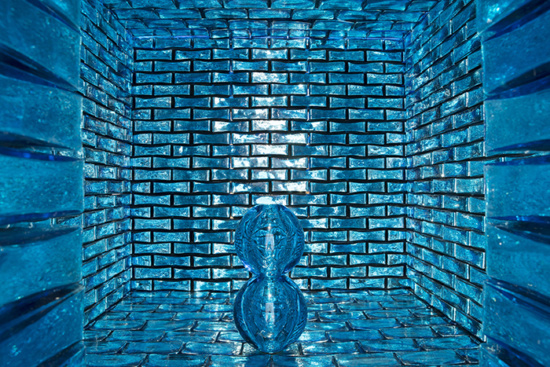 By far the largest gallery on the Lower East Side, it is also perhaps the most pronounced. 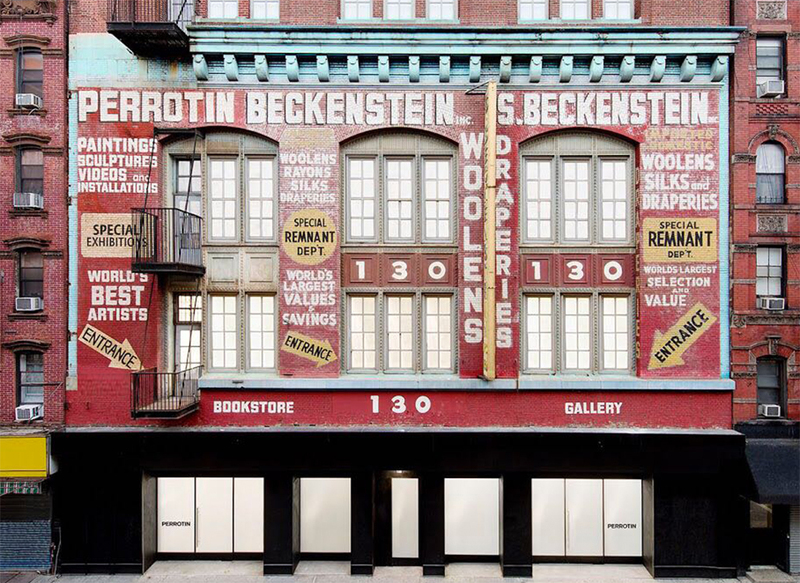 From the outside, a sleek black steel and glass entryway that conforms with Perrotin’s signature look contrasts with the colorful signage overhead—original painting from the fabric manufacturer and wholesaler that historically occupied the building, updated with Perrotin-specific accents. 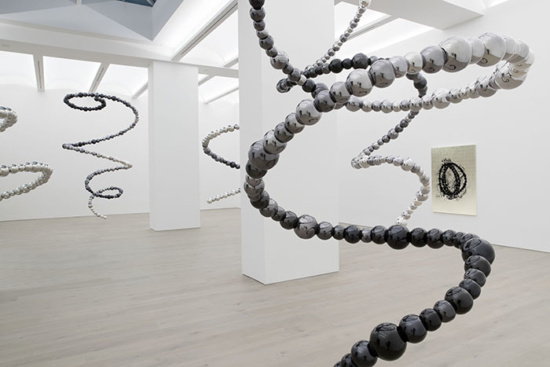 Edged by a black steel stairwell that connects the three floors of exhibition space, each floor is punctuated by its own desk space and entryway, providing a break and lending rhythm to the experience of moving through the galleries. 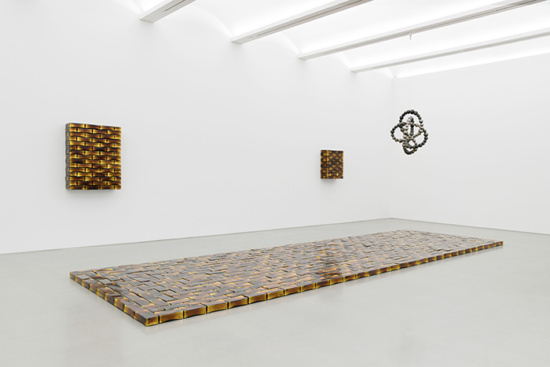 The second-floor gallery, which for its inaugural show displays the work of Brooklyn-based artist Artie Vierkant, is smaller, which principal Nathan Rich suggests is ideal for staging more experimental exhibitions with younger artists. At the top floor, just beyond the landing, one emerges into a vast, light-filled space, where rippling arches are punctuated by the pyramid of a skylight. 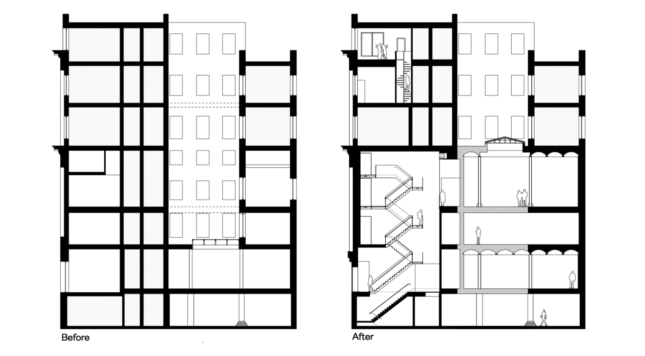 The dramatic room, with its 20-foot ceilings, required major structural interventions to make it possible. 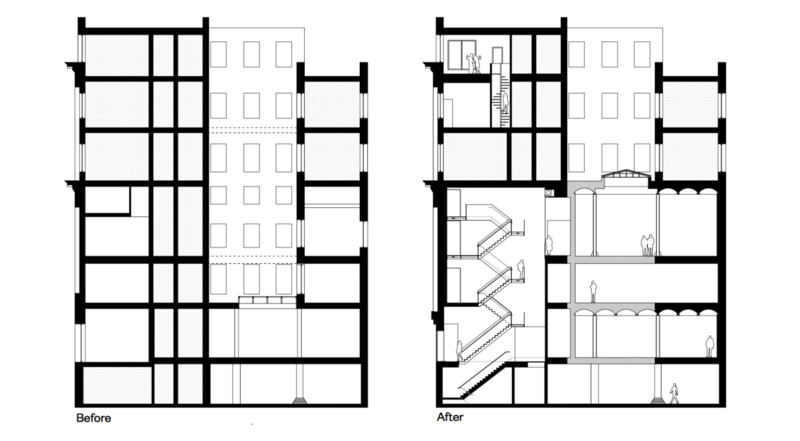 The building originally had a central courtyard, which the architects filled in to create the exhibition space. Since residences still exist above the gallery, this was no simple matter of just knocking down some walls. Besides the obvious engineering challenges, noise disturbance was a concern. To dampen the noise of the falling walls, builders laid a matrix of tires in the center of the space for bricks to fall into. The white columns that remain in the space are the remnants of these original outside walls. Luckily, thanks to its manufacturing past, the building’s floors can withstand tremendous weight for heftier sculptures and installations. Not content to place heavy art low to the ground, PRO developed hidden tracks in the ceilings designed to support substantial projects of up to 3,000 pounds. 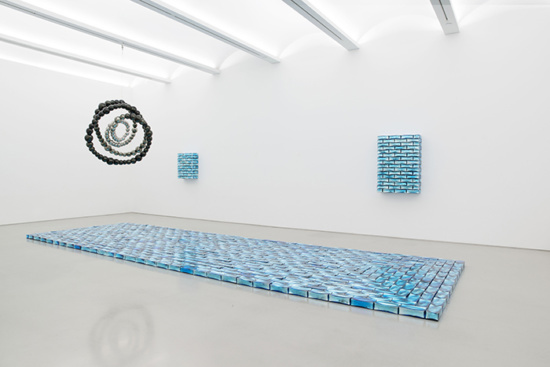 This load-bearing ability is ideal since the inaugural exhibition of French artist Jean-Michel Othoniel features heavy hanging helixes of glass and metal. Integrating the necessary functional infrastructure, like the hanging tracks, is part of what Peterson refers to as “the ballet of designing an art exhibition space,” where so much has to be made to look like so little, and a great deal of effort goes into making it all seem effortless. 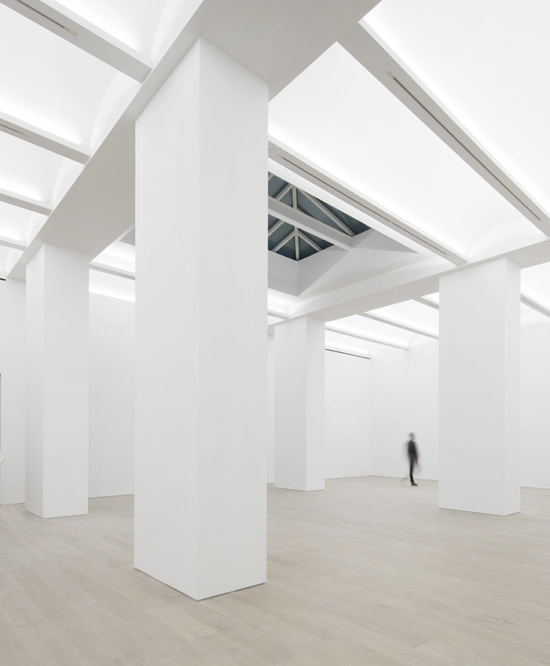 PRO’s new Perrotin deftly performs this architectural ballet for a cohesive, and even meditative, experience.